A palace of refined and original entertainment.' Thus the old Dolphin Theatre had once appeared to its erstwhile owner, Mr. Adolphus Ruby. To Peregrine Jay, the young playwright now lusting to own it, it signified something not very different. Down by London's docks, with its derrcpic ornaments and fading gilt. it spoke clearly to Peregrine of a contemporary revival of ? oi-^at English tradition of theatre—and in a most seductive voice. And Peregrine, through an outlandish train of circumstances, did actually become the master of the Dolphin. The old theatre was renewed, and its stage again became busy with Peregrine's own play about an episode in the life of Shakespeare himself. This state of bliss was shattered by a murder at the Dolphin. From the murder stems a mystery, which brings Superintendent Alleyn, Inspector Fox and their colleagues to the old theatre in the role of investigators. 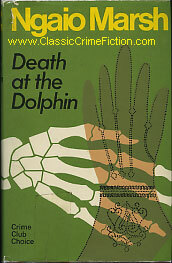 Ngaio Marsh ranks among the greatest of the writers of detective novels. Hers is a household name, and her legion of admirers will be delighted with the humour, the setting, and the tantalising mystery of this exciting new novel.